Emc2 core analytical skill is in computational fracture mechanics and we have extensive capabilities and diverse experience in the numerical determination of crack driving force for simple and complex structures. Although we are well known for flaw evaluation in piping and pressure vessels, we have conducted structural integrity analyses on a large variety of small to large structures. We are experts in the application of a number of industry codes but our experience also includes assessing structural integrity issues that are not covered by existing codes and standards. Some examples go from the extremes of; modeling of a whole nuclear power plant containment building with the reactor pressure vessel, steam generator, pump, pressurizer, and primary/steam/surge-line pipe loop; off shore platform sections; large off-road vehicle sections; to snow plow blades, golf club heads, bio-system parts, etc. Below are specific areas where we have developed industry leading solutions for our clients in the nuclear and oil and gas industries. Emc2 staff has studied different types of flaws (corrosion thinning, through-wall and surface cracks, mechanical damage, etc. ), multiple site and multiple element damage of aging aircraft, and high temperature creep-fatigue assessment of engine components including turbine blades in life-extension studies for our clients. The piping and pipe component fracture efforts at Emc2 have involved different flaw orientations (axial, circumferential, and helical for spiral-welded pipe), crack initiation and crack propagation evaluations including natural crack growth. In the nuclear industry, there are regulatory requirements for analyzing how cracks grow when the nuclear plant piping subjected to loads from seismic or other dynamic events. The results of these analyses are used to development the requirements for Emergency Core Cooling Systems (ECCS). The initial requirements were developed in the 1970’s and the US Nuclear Regulatory Commission (US NRC) has been continuously working in this area to find new ways that better predict behavior of the piping systems in order to improve the design and safety of new plants. Emc2 has worked closely with the US NRC since our founding in 1998 and have pioneered the development and validation of a special cracked-pipe finite element code to determine crack initiation and amount of crack growth that can be expected for plant piping subjected to seismic and/or water-hammer loads. Using this approach, we conducted a robust leak-before-break (LBB) evaluation to assess the safety aspects of the piping system under beyond design basis seismic loading and implications to the ECCS. (This sentence seems incomplete. To accomplish this, we modeled an entire nuclear power plant, including the containment building and primary feed system, to simulate seismic loading on cracks in the pipe loop to determine how they grow. The results of our work are helping the US NRC develop better and more up to date safety regulations for nuclear power plants. Advanced Finite Element Analysis (AFEA) method is used to simulate ‘natural’ crack growth using PipeFracCAE© which incorporates an automated FE mesh generator developed by Emc2 for NRC for PWR pressurizer SCC’s. This iterative FE meshing and FE solver program determines K at every location around the crack (normal to crack surface), calculates the crack growth, and then updates the FE mesh including crack geometries. The FE Solver will then iterate between 200-400 times to get evolution of the entire crack shape. Our analysis also includes the weld residual stresses along with normal operating stresses to improve the accuracy of the PWSCC crack growth predictions. 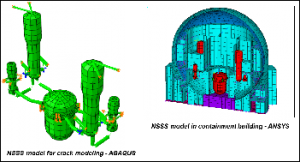 The FE meshes generated from PipeFracCAE© can be used as a direct input for the commercial FE code ABAQUS. This method has been used where sub-critical crack growth is sensitive to weld residual stresses as well as other normal operating stresses, including thermal loads. Our staff have performed structural assessments in multiple engineering disciplines including piping and vessels (nuclear reactor systems, oil/gas pipelines), mechanical, aerospace (including aging aircraft and for NASA flight vehicles), and chemical (including high temperature assessment and resistance to chemical warfare agent (CWA) and various decontamination systems). Emc2 plays a lead role in characterizing the structural integrity and service life assessment of high density polyethylene (HDPE) pipe for safety-related service water applications at nuclear power plants. 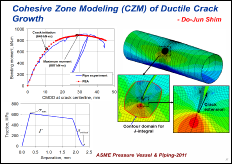 Emc2 actively participates in the ASME Boiler and Pressure Vessel Code meetings that develop industry consensus standards for HDPE piping in critical application for the nuclear industry.